Medway Fine Printmakers is a printmaking studio with a fantastic range of presses and printmaking equipment with which to make fine prints on paper and textiles. We collaborate with other artists on courses, events, projects and exhibitions and have built up a friendly community of printmakers. Join us in Medway where Rochester meets Chatham – only 40 minutes from London by train. Our much loved Victorian building INTRA on Rochester High Street has a fantastic Art Deco frontage and is a landmark in the historic area of Chatham Intra. We run short courses and weekly open-access printmaking, we take part in Medway Open Studios and host our own events. The large open workspace at the front of our building can be hired for activities or events, and our print studio can be hired by the day for groups to run their own club or teaching sessions for intaglio, silkscreen or relief printing. 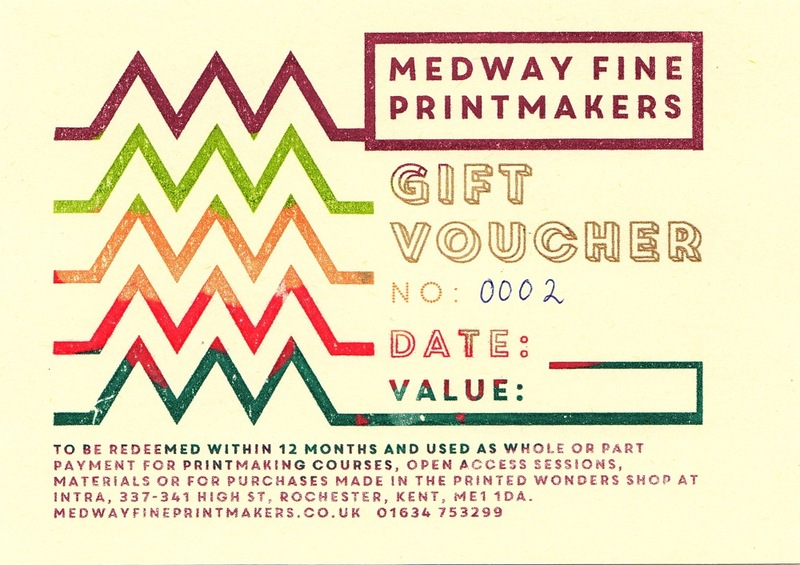 If you know someone who would love to do a course, but you’re not sure which one – maybe a hand printed Medway Fine Printmakers gift voucher would make the ideal present. They can also be used for open access sessions, materials, and in the Printed Wonders shop at INTRA. For dates of scheduled classes – see panel on the right of this page, or request a date for one of the regular courses we offer. W e welcome the opportunity to work with schools, individuals and home education groups and can plan classes either using the specialist presses in our print studio, or by bringing some of our printmaking equipment to your classroom or space. Most of our classes can be tailored for younger people and we have worked with groups of all ages. We facilitate preparation work for art scholarships, deliver elements of BTEC courses, and worked on some large scale projects with schools. Please contact us if you’d like to arrange a visit or class. Hi I’m very interested in design and print courses particularly on silk. There are several of our courses that can be applied to silk work – have a look in the courses section. At the moment we don’t have a specific course for printing on silk, but I’ve been planning a two day or evening course on textile repeat patterns using different techniques that would be relevant. I screen print on silk sometimes and it does hold some particular challenges! Drop me a message medwayfineprintmakers@gmail.com or use the Contact Us page and I’ll tell you more about what we could do.